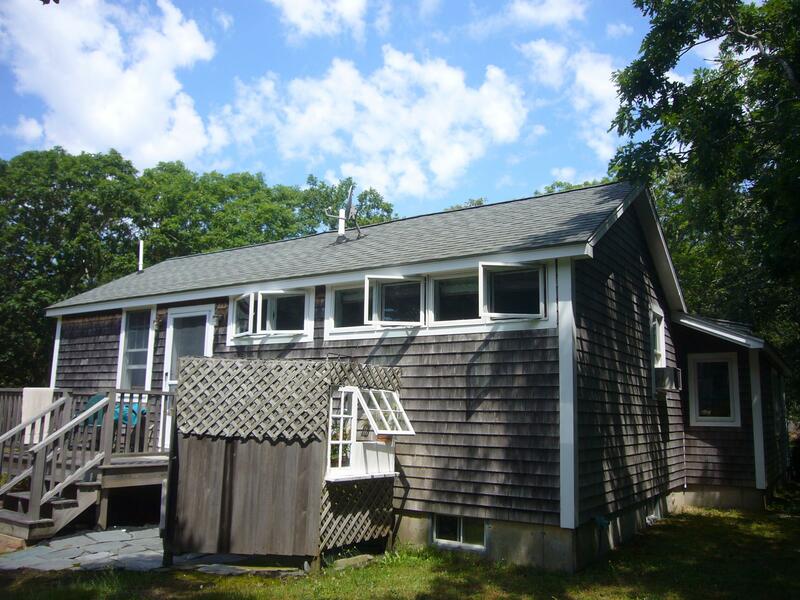 We bought an 1,142 sf one story house with full basement, gutted and superinsulated it, and added 192 sf on piers. The initial blower door test was 3,117 CFM50. Interior finishes were in poor shape; the floor plan was worse. We wanted to fix an existing building on a developed site rather than build new, even with the attendant compromises. Windows, doors, fiberglass batts, and mechanicals were salvaged for others’ use. All systems and interior finishes were replaced. 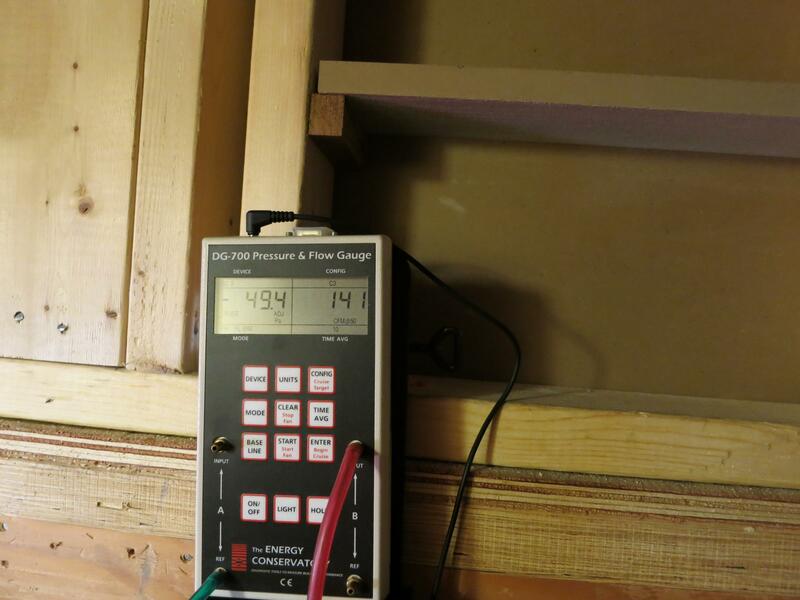 The basement walls were insulated with three inches of polyiso foam, about R-18. 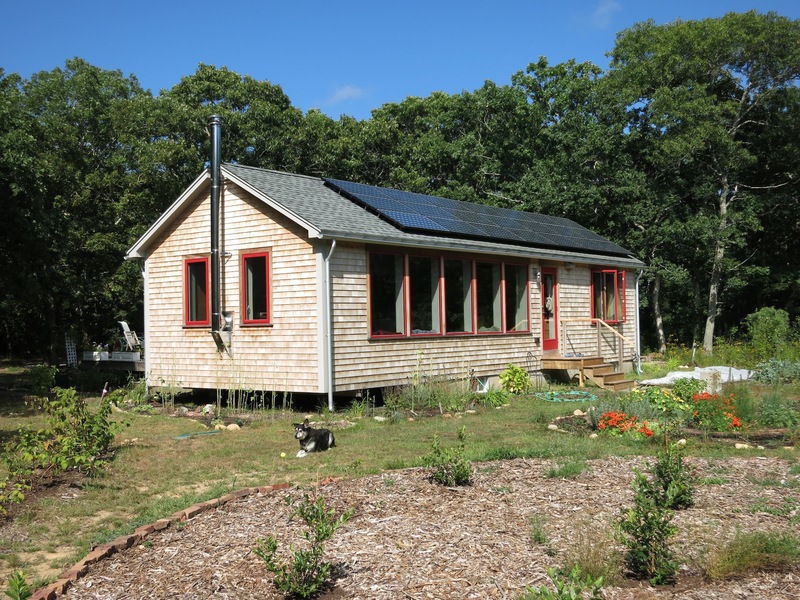 Retrofit insulation hasn’t yet been applied to the slab, R-10 is installed beneath appliances and stairs. 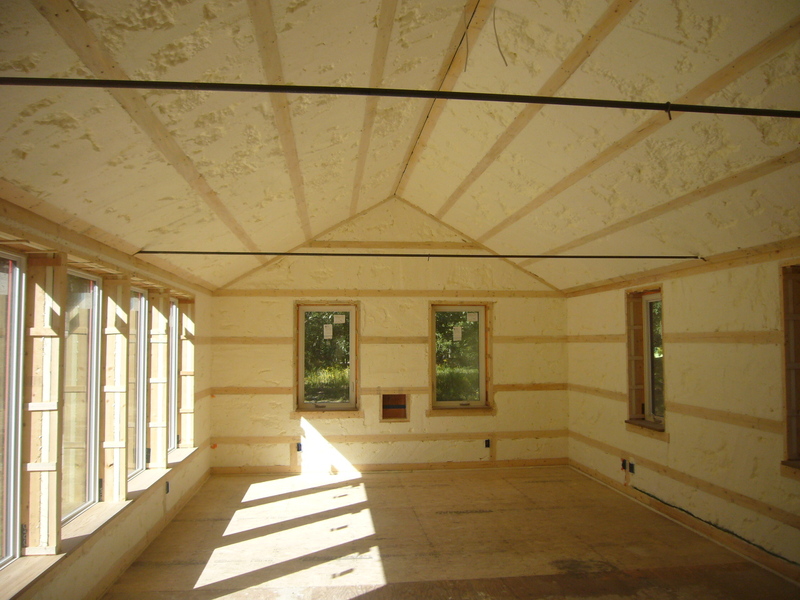 2x4 flat horizontal strapping was applied to the existing 2x6 walls and 2x10 rafters, separated by small pieces of 1-1/2 inch polyiso foam, so as to create a thermal break and a deeper cavity. Walls are 8-1/2 inches and the roof is 12-1/4 inches, and both are filled with water-blown spray foam, first three inches of closed cell, then open cell. Effective R values are R-32 walls and R-44 roof. The exposed floor is R-50. The blower door is 141 CFM50, over 20X reduction. Windows are Alpens with foam in the hollow fiberglass pultrusion. Half the glazing faces south. Casements/awnings have triple, SHGC 0.59 argon-filled glazing with two Cardinal 180 low-e coatings – the NFRC U value is 0.18. South-facing fixed windows have a low- iron outer pane to bump the SHGC to 0.62; U value is 0.16. 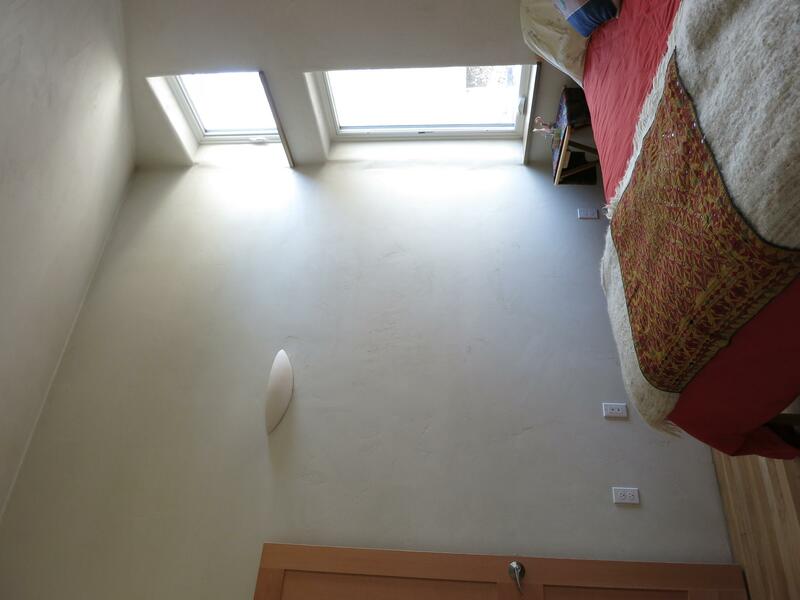 The skylight is a Wasco with similar triple glazing. Doors are foam-filled fiberglass with double low-e argon-filled glazing which will be replaced with high R value glazing. Lighting is screw-base LED. The house is beautifully daylit. Appliances are Energy Star and the range has an induction cooktop. An eMonitor provides energy data on most circuits. A 3⁄4 ton ducted (350 CFM) Fujitsu heat pump (AOU9RLFC, 12.2 HSPF/21.5 SEER) provides heating and cooling. Ducts are sealed with mastic and heavily insulated. Space setpoint is 70F with no setback (I have found little savings setting minisplits back). We expect reduced consumption this next year from solving a control quirk in the heat pump that caused excess energy usage. A Zehnder ComfoAir 200 provides ventilation at close to 90% efficiency via a dedicated duct system. A Stiebel Eltron HPWH makes hot water. PEX piping is insulated, with short runs. The HPWH extracted energy is roughly equal to the waste heat from the 15 ft3 freezer and PV inverter. Delta H20 Kinetic showerheads deliver a great shower with low flow. A horizontal axis washer saves water and drying energy. 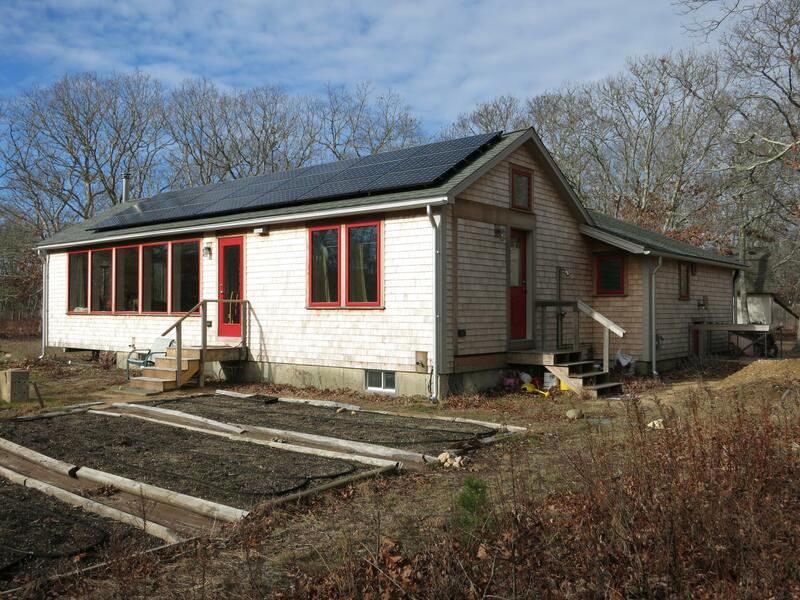 Onsite power is a roof-mounted, grid-tied 4.76 kW Sunpower system which generated 22% more energy than was used. Total energy use was 13 kBTU/sf/yr or 41 kWh/m2/yr. 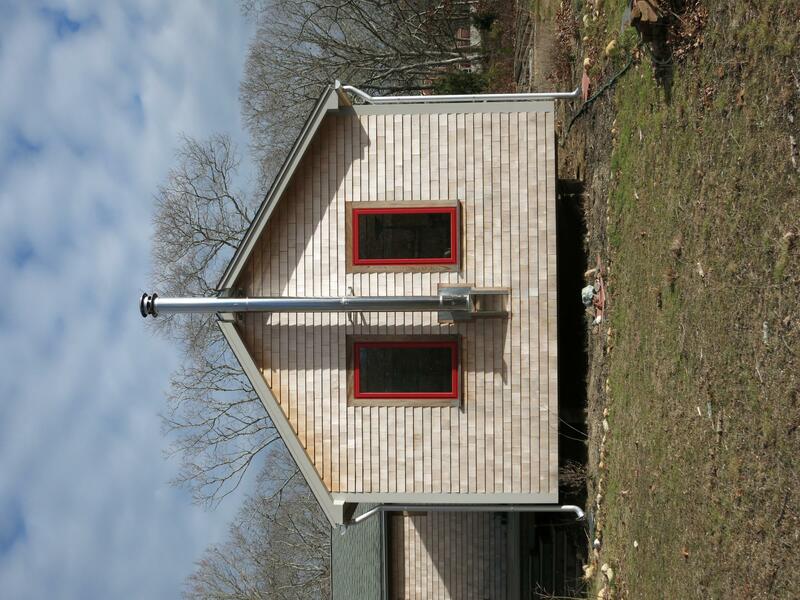 A woodstove provides ambiance and heat during outages – it was not operational during the data period. Our location facilitates cycling to work and errands, reducing our transportation energy. The 1,128 kWh excess produced could power an electric vehicle over 3,000 miles as well! The basement walls were insulated with three inches of polyiso foam. 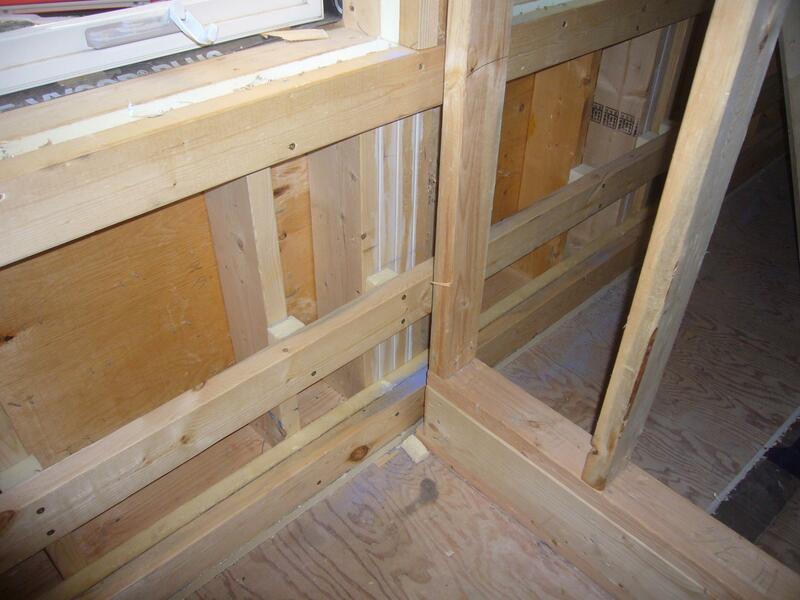 Walls are 8-1/2 inches, filled with water-blown spray foam, three inches of closed cell, then open cell. Once we bought the new house in the fall of 2012, we began to work on the new design. 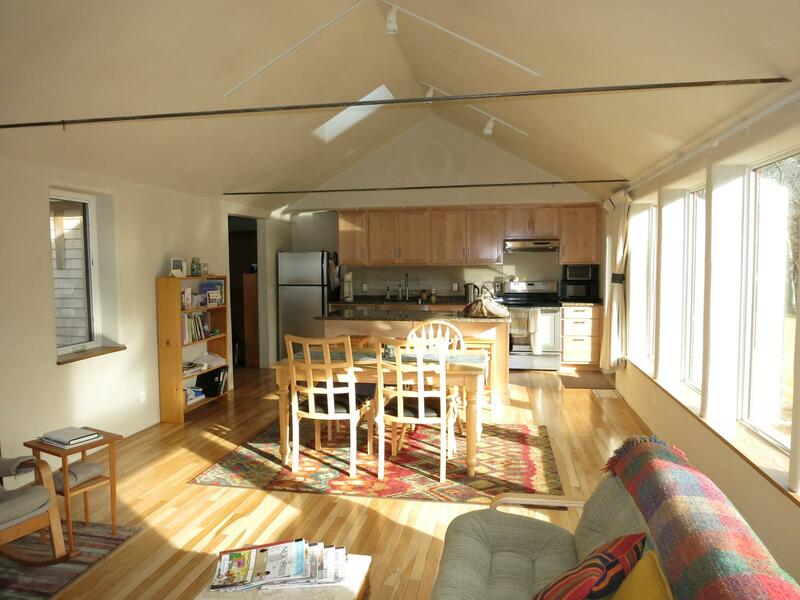 We were starting with a one bedroom house of 1,142 sf, on one level with a full basement. There were some framing oddities that were revealed as the gutting process proceeded. The house, though very leaky, had 2x6 walls and 2x10 rafters. It had a low wall plate height of about 7'6" but most of the house had ceilings that followed the roof line. Its south side faced about 11 degrees east of true south. We had good solar access, which was improved with some selective tree cutting. There was a separate outdoor entrance to the basement, but it cut off east light to the house. Given that we both might end up working at home in years to come, we wanted three bedrooms. Although it’s a bit of a luxury, we had developed an appreciation for having two bathrooms for when guests visit (and for eventual resale of the house). After the sun-drenched quality of Nerdwood we never got used to the paucity of natural light in the main public space of House 5, especially in the winter when it was shaded by the house to the south, so a well-glazed south façade was a key program element. And we wanted a good entry space with a generous closet and space for a bench. I worked on several schemes, including variations that added a small addition to the existing one floor house, and variations that added a partial second floor. I had some solutions that would be good but added too much new space, which drives up the cost. I drew my SMC architect colleagues Ryan Bushey and Matt Coffey into the process, and both were instrumental in improving the design. Finally Matt bore done on the design one evening and with a few deft strokes drew a scheme that vastly improved anything I had done while keeping the new addition to 12’x16’. I’ve made a few tweaks to his design, but what we’re building is fundamentally true to his concept and as the spaces took shape we are so grateful for his intervention. The final design has a generous entry space and closet, two small bedrooms and a modest master bedroom, two baths, and a thirty foot long great room space on the south. Given that it is a one story house, my design had a few small skylights to bring in top light. I had passed the design around to other friends in the design biz, and Jamie Wolf of Wolfworks had some of his usual insightful questions, and the one that really hit home was, why so many skylights? That prodded me to look at each one carefully, and we’ve ended up with only one, above the kitchen island. 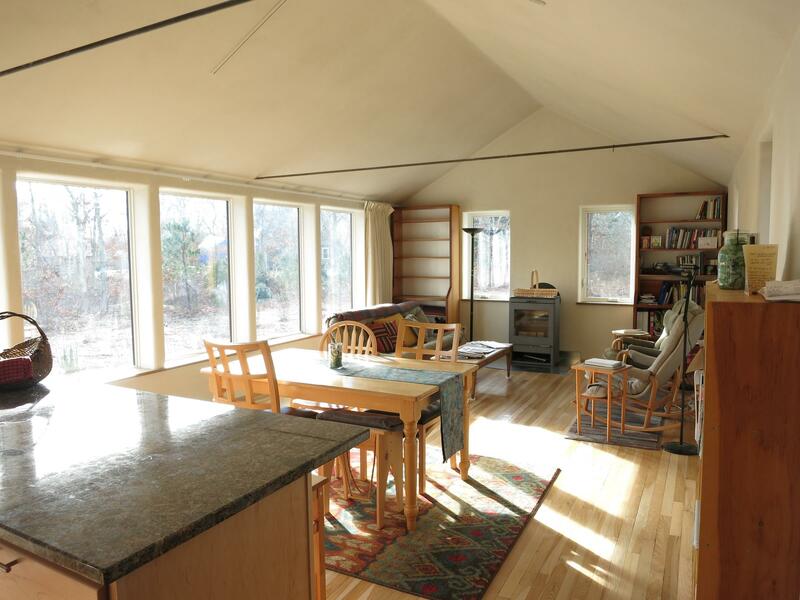 Having a one story house with cathedral ceilings enabled us to use awning windows high in the gable ends to bring light high into the bedrooms without putting a hole in the roof. Thanks Jamie! In the photo below you can see we've pushed the windows hard against the wall so as to use the wall most effectively as a reflector to bounce light across the room. Matt’s design solved one of our conundrums, which was how to get easily from the house to the basement. We wrung our hands about giving up an exterior access to the basement, but justified it because of having so much storage/shop space in our outbuildings. My architect brother-in-law Paul Hajian of Hajian Architects looked the plans over, and said, your basement stair has a landing 2/3 of the way down that is on the outside wall, you could cut the foundation there and access that landing from outdoors too. Great idea! So we cut a notch and built an exterior stair. Once inside, the stairs down are to the right, which might make it challenging to get something long into the basement, so we hinged the main run of stairs at the top, so they can be hoisted up out of the way if we want to get a kayak or suchlike down there. We’ve been so fortunate to have so many talented designers looking over our shoulder and making this little house sing. Thanks all! It always costs more than you think!